Don't let its small size fool you. 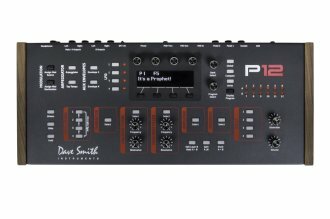 The Dave Smith Prophet 12 Module boasts the same power and sound as the Prophet 12 Keyboard. Each of the Prophet's twelve voices is composed of a brand new hybrid digital/analog architecture that sounds different than any other Dave Smith line of synths, yet retains the true Prophet vibe. With a humongous twelve voice polyphony, sophisticated architecture, and sleek design, the Prophet 12 is ready to handle any sound in any setting. The Prophet 12 is the most cutting-edge hybrid synthesizer on the market and defines what a modern polyphonic synthesizer is. Designed and manufactured in San Francisco, the Prophet 12 Module has a glorious combination of form and function in a sturdy, portable and elegant build. Use it as a desktop module or add it to your rack with the optional rack mount kit. Dimensions: (L x W x H) 16.5 x 6.8 x 2.85"
Available until 11 PM (EST) today. Mention special code 207-Y7LG when you call.